Another indicator of the weak recovery since the end of the Great Recession is the growth of world trade. This is well down on the pre-crisis rate of growth. 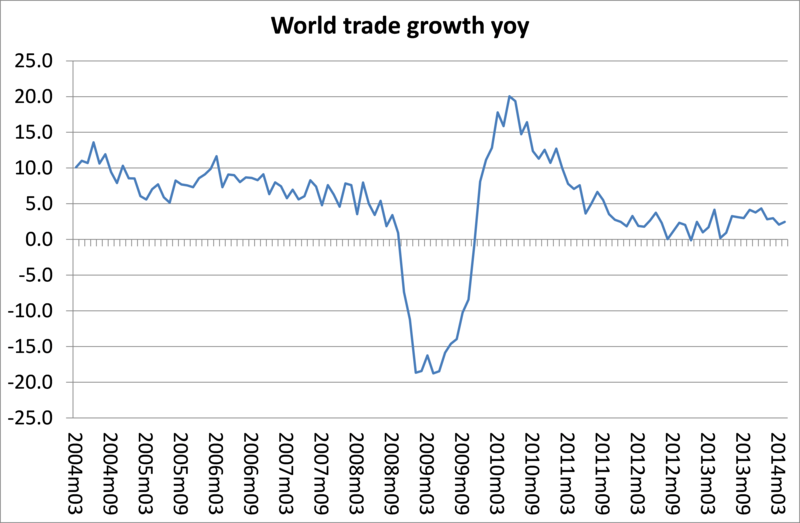 World trade is now growing at about 2.5% a year compared well over double that before the crisis. And here is the staggering thing. For the last six months global trade growth has been below world growth in industrial output – the longest period that has happened except during the Great Recession itself. 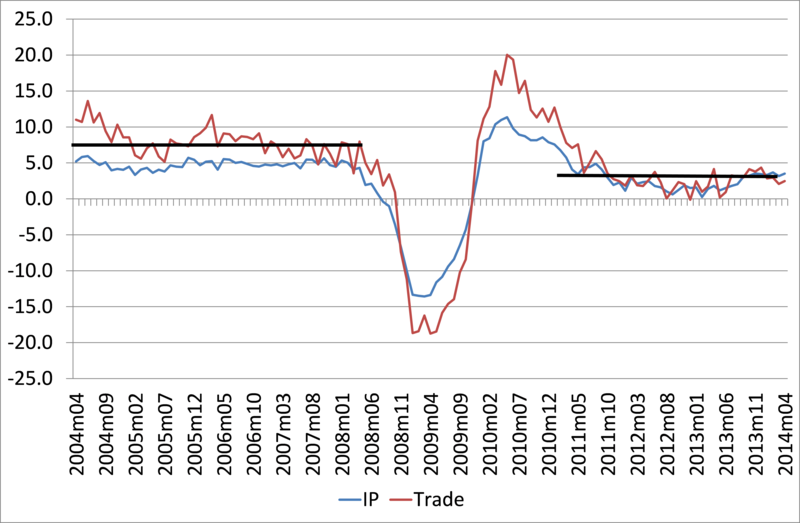 In the graph below, the red line below shows the rate of growth in world trade and the blue line shows the growth in global industrial output. 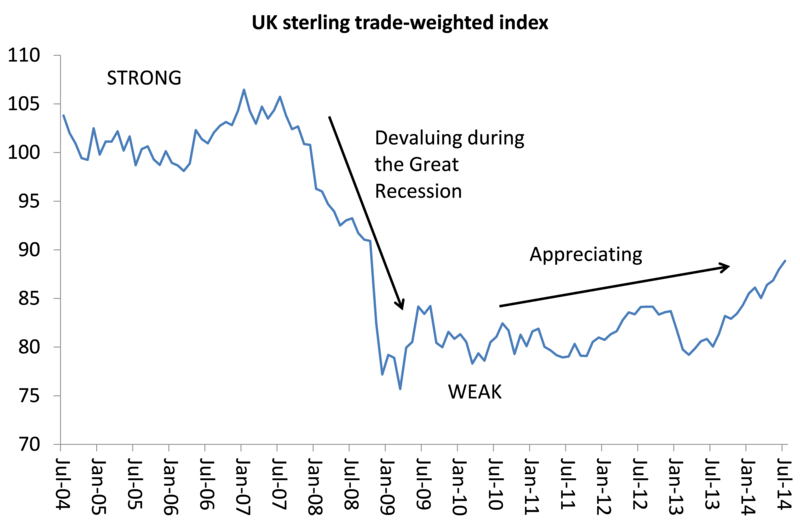 Both are lower on average than before the Great Recession (black lines). But the red line is now below the blue. And that’s bad news, because it means that national capitalist economies cannot expect to escape from weak domestic expansion by selling more exports if world markets are growing even slower than world industrial output. This is a recipe for more intensive competition in those markets and probably attempts to devalue national currencies relative to others to improve exports in shrinking markets. The Japanese are already deliberately trying to weaken the yen by pumping more yen into the domestic economy and the ECB in the Eurozone is planning the same. The UK pound was devalued sharply during the Great Recession to give British exports an edge. But the UK export share in global trade continued to fall and Britain’s external deficit has widened. Now with a weakening euro and yen, and to some extent, the dollar relative to sterling, Britain’s exporters are going to lose even more share. This entry was posted on July 21, 2014 at 3:05 pm and is filed under capitalism, economics. You can follow any responses to this entry through the RSS 2.0 feed. You can leave a response, or trackback from your own site. For some days ago I heard a Danish economist predicting a dollar bubble and the risk of a dollar crash because of the printing of paper money (state bonds) of the American Central Bank. Do you have any comment on such a development?